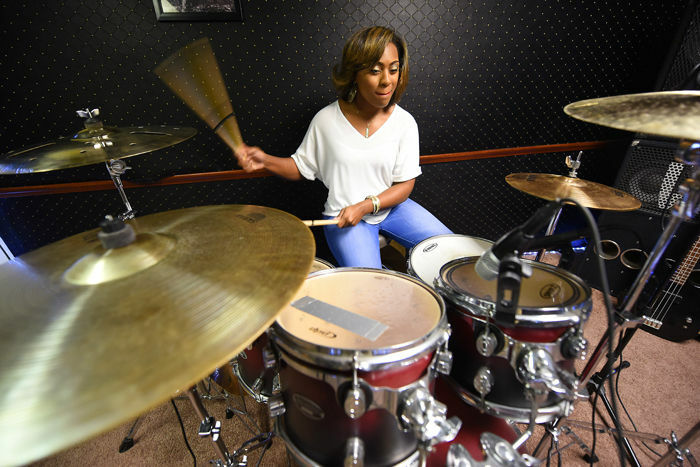 Gulley, who grew up in Mobile, said she started playing drums at age five after watching her two older brothers play multiple instruments in their church. Gulley said her first opportunity to perform outside her home as a drummer was at age 6, when she played the drums after a church service. Gulley said her parents purchased her first drum set at age 10. Before then, she said she used encyclopedias and other items to practice. Gulley said the only female drummer she knew of growing up was celebrity drummer and percussionist Sheila “E” Escovedo. “When I was younger there weren’t many women who played drums that I was exposed to, so I was more influenced by how men played the drums – how it was a harder, more aggressive beat and you could feel it,” she said. Her advice to women interested in playing instruments that have traditionally been considered gender-specific is to “go for it. This entry was posted in Drum/Music News and tagged Allison Gulley, Drummer, Scott K Fish. Bookmark the permalink.